New 26,000 SF building features a 700-seat concert hall designed to accommodate a wide range of programming, including large orchestras, ensembles, choirs, jazz, amplified music and lectures. 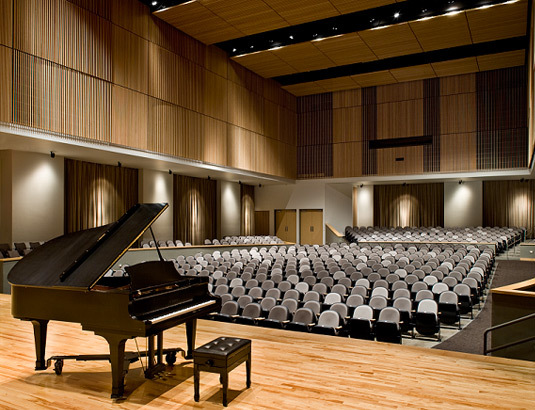 A desire for exceptional room acoustics within a set budget was met through utilizing precast concrete exterior panel construction which serves as an effective barrier to outside noise and supports a rich reverberant sound inside the hall with excellent warmth of tone. While the room’s large volume supports large ensemble performances, visual room boundaries are created with a wood grille that hides more than half of the total room volume from view and conveys an intimate setting for both performer and audience. Adjustable acoustics enable the room to function effectively for different ensemble types and sizes. Features include a series of doors around the performance platform and retractable curtains around the room. These allow the auditorium to be to appropriately scaled and tuned for the needs of each particular performance. Featuring superb acoustics, the concert hall showcases student talent and hosts guest artists including the Atlanta Symphony Orchestra.